Structural biologists have made important progress towards better understanding the functioning of the circadian clock. The circadian or inner clock coordinates the sleep-wake rhythm and many other body processes that regulate, for example, metabolism, blood pressure, and the immune system. A research team led by Professor Eva Wolf, recently appointed Professor of Structural Biology at the Institute of General Botany of Johannes Gutenberg University Mainz (JGU) and Adjunct Director at the Institute of Molecular Biology (IMB), has for the first time identified the molecular structure of a protein complex that plays an important role in regulating the circadian rhythm. At the same time, they also made a surprising discovery: The protein complex contains a zinc ion, which apparently stabilizes it. These results could form the basis for new strategies for treating illnesses that are the result of circadian clock dysfunction. "Our circadian clock controls many important physiological functions," explained Professor Eva Wolf. If the natural rhythm is disrupted, as for example in the case of people on shift work, the likelihood of developing metabolic disorders, diabetes, or cancer is significantly increased. The fundamental research conducted in the Wolf group is focused on obtaining insight into the molecular mechanisms of the circadian clock. Among the currently investigated topics are the cryptochromes, a class of proteins associated with the circadian clock in mammals. In addition to regulating circadian rhythm, these also control glucose homeostasis and blood sugar levels. Together with another clock protein called period they form a complex, the structure of which has just been determined by Wolf's team. 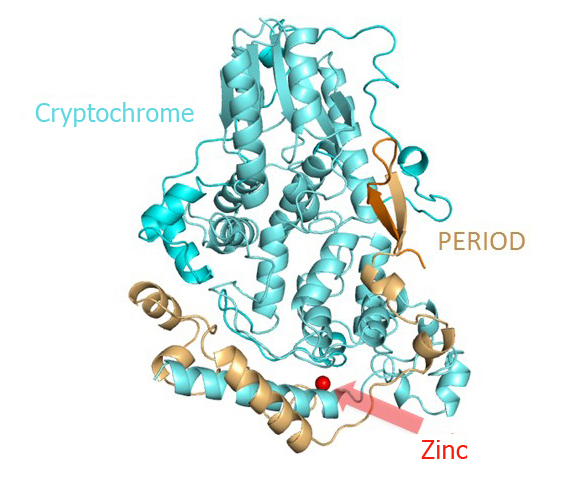 By x-ray analysis of the cryptochrome-period complex structure, the researchers were able to observe atomic details of the interaction between the cryptochrome and period proteins and also discovered that the zinc ion mediates this interaction. "The metal ion stabilizes the complex and also appears to influence an adjacent disulfide bond," clarified Wolf. Cell biological studies conducted in the collaborating group of Professor Achim Kramer at the Charité Berlin showed that this also is the case in human cells. The researchers had not expected to detect a disulfide bond in the presence of the redox state that prevails in the cytoplasm and the cell nucleus. Its existence is probably regulated by the zinc ion and the disulfide bond itself is perhaps a sensor that indicates the metabolic status of the cell. 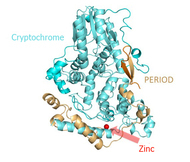 "We assume that the formation of this cryptochrome-period protein complex provides a mechanism by which the circadian clock interacts with the metabolism, while the zinc ion and the disulfide bond play an important role in regulating the stability of the complex," summarized Wolf. The now Mainz-based biologist hopes that further findings about the basic functioning of the cryptochrome-period complex and her aim of determining the interaction patterns of further clock proteins may help in the development of future medical treatments. Three-dimensional structure of the mouse cryptochrome-period clock protein complex. The complex is stabilized by a zinc atom coordinated by both proteins.